This post contains affiliate links which means that I may receive a commission if you click a link and make a purchase. Nooooo!!! It has happened to most of us, and usually happens in s-l-o-w motion when it does: your phone takes the deep plunge, goes for a swim, dives into the deep end. Any way you say it, when your phone splashes into water, your heart stops for a half second and you immediately pray that somehow, someway, your phone will survive it's liquid vacation. There are some great tips to help increase your phone's survival rate, but if you find yourself unable to resuscitate your beloved device, have no fear - Gazelle is here! Gazelle has you covered with 'like new' devices at an affordable price that are all put through an industry-leading 30-point inspection to make sure that all features are fully functional and offers you the peace of mind of a 30-day risk-free return period, all with no contracts or strings attached. 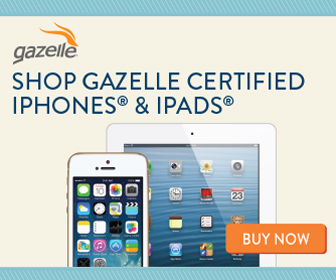 So if your device decides to take a bath, make sure to check out Gazelle for your replacement! Little Tikes "Big Dog Truck" Giveaway!